We loved this cabin and you could tell the owners took a lot of pride in it. The ping pong table was a big hit lots of competition. The hot water was still not fixed when we got there, after I had e-mailed and called to make sure from all the other reviews that there was a problem. Cabins USA sent out someone right away and he said one of the heating elements was bad he drained the hot water heater and replaced no problem with hot water after that. We did not like the drive to the cabin and always made sure we were back before dark. Our van drug everytime we went up the hill to the cabin. I would recommend this cabin if you aren’t nervous with the drive to it. Beautiful cabin and beautiful decorated. Had something on bed cover and one of the couches but other than that everything was clean. This house was great, gorgeous views, comfortable beds, cozy family and living rooms and the entertainment this house provides is exactly what is needed! I would stay here again only if they were to fix a few of the issues we had. The major one being, the hot water heater. There is only one shower that gets hot water for any length of time to take a decent shower. The rest (one being the master bath) you have to be in and out within a couple of minutes. So, don’t even try and fill up the whirlpool tub. I’m sure you see where I’m going. The other is the stove, only two burners worked. If they were to replace the hot water heater with a larger one that could accommodate the size of the house, then it work be one PERFECT getaway!!! My family goes to this cabin every year, and it is absolutely fantastic! Some needed upgrades have been done, and I can’t imagine a better cabin anywhere in the area. If there is one thing that I would make a suggestion on, it would be better lighting in all the rooms. We LOVE this cabin and look forward to our time there every year. The cabin was awesome. All the amenities were great. The location was really close to the main strip in pigeon forge so that was convenient. Driveway was a little steep and could cause some issues with snow or ice but fine if the weather is ok. Our only complaint was the hot water heater. There definitely needs to be another one or a bigger one. There was enough hot water for one short warm shower and after that it was ice ice cold for hours. If they fixed the water heater issue we all agreed we’d def stay in the cabin again. Great cabin over looking the mountains. Plenty of room for the whole family. The driveway is pretty crazy though! Straight up lol. Had a bad rain and wind storm and had a few leaks downstairs but other then that it was a great stay. Just a tip if your staying for a week or so bring extra napkins, paper towels and stuff like that. The cabin was beautiful with an amazing view! The drive up to it was a little sketchy at first due to the way the gps brought us but it’s easier following the directions that the company gives out. Parking was a little misleading in the photos. The driveway is pretty steep but manageable! My family would stay here again! It was a short drive to the parkway which was nice and convenient. Overall great cabin! Apon arrival the cabin looked beautiful. It looked just like the pictures showed on the website. It appeared clean at first glance. Later when getting in to the hot tub the water was slightly green and the bottom felt like it had a coat of slime on it. We stayed for 2 nights and on the first night there my fiancé and I who were there to celebreate or engagement tried to take a bath and to our surprise there was no hot water. We tried again the following night and once again, no hot water. Better yet it was as if they turned our water off a whole 12 hours before our checkout time. We still had no water at all by the morning of our checkout. If those few things were not an issue this cabin would have been perfect. If you don’t mind those things I would fully recommend this cabin. The view is beautiful and it feels very homey. The games were also a nice feature. This cabin is amazing! Our favorite out of all the ones we have stayed in previously. We loved the location, privacy and the amazing views. It was decorated beautifully, the beds are so comfy and all the games provided are so nice. Honestly, we didnt even want to leave the cabin. The only complaint I have is that the tub in master bedroom has no hot water ☹ Everything else was perfect! We will definitely be back to this cabin! Thank you so much for a great experience this past weekend. There were 9 of us that stayed in your cabin Cherokee Hilltop for my sister's bachelorette party. We stay with you guys at least once a year so I knew exactly what company we would be staying with during our trip. Everyone had a great time and was very excited about all the things that were included in our cabin. Pool table, hot tub, Skee-Ball, ping pong table. The only thing that was a little deceiving is the parking it looked on the picture as there were going to be a parking area in front of the cabin. When we get there there is no parking in front of the cabin because that's a straight heel. It was just fine though for the vehicles that ended up going with us which was a total of 3. I'm very pleased with my experience again with you guys and we'll come back and stay again. We had an amazing stay at Cherokee Hilltop. The view is absolutely amazing. The drive up to the cabin is a bit steep but you get used to it. Not sure driving down the hill would be safe during the winter. We had an all girl week. Sisters and sister-in-laws. Very quiet and peaceful. View was beautiful. We will definitely rent this home again. 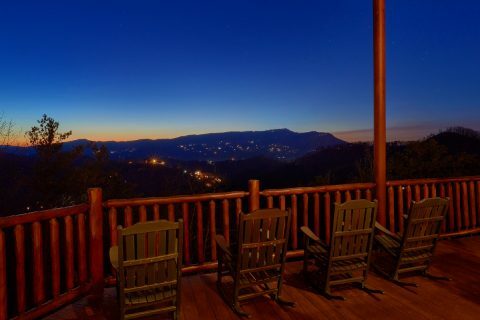 The back patio and great Mountain View was worth the choice of this cabin. They seemed to have the bee issue under control which was nice to be able to sit outside and enjoy drinks. The area around the cabin felt open and comfortable. The layout of the cabin and spacing between rooms was a pro as well. Cons: The living areas furniture needs a complete overhaul. You do not feel comfortable sitting down. It felt so worn out and dirty. We did not use the tv much but there are hardly any channels to choose from so bring lots of dvds or bring a computer if you have access to your home cable network and can plug in with an HDMI cord. The master bathrooms shower does not warm up. The kitchen could probably use a new stove. Two burners did not work plus the oven took a very long time to pre heat. We stayed here 5 nights and ate in 4 of those nights. No extra garbage bags or paper towel but plenty of cooking ware and dishes. I would still recommend this cabin as it is centrally located to downtown pigeon forge and a short drive to Gatlinburg and the park. The lower level is great for kids with a separate bathroom living area and 2 sets of bunk beds. Loved the cabin and its spaciousness, only complaint is that the master bath shower water would only get luke warm and jacuzzi in that bath would not get warm at all. This was a beautiful cabin, spacious, and had a lot of entertainment for kids. The living room stayed very warm during the day due to no blinds on Windows so, it stayed inn the 80's in the living area. That was the biggest issue but would rent the cabin again. Thank you for a great vacation! I was a little worried after previous experiences with other rental companies that the cabin was not going to be what the pictures showed but was pleasantly surprised that the pictures represented the cabin perfectly, it was clean, all the amenities that you needed and then some, fully stocked with towels, extra sheets and blankets. There was more then enough room for all 7 of us to we’re we never felt crowded, the view was amazing. The owners definitely care about there property and I felt that thought of everything that would make your stay comfortable and worry free. We had an amazing time and will definitely be booking this cabin again. Our family had a wonderful time staying at Cherokee Hilltop. It is a beautiful cabin with breathtaking views. The driveway is quite steep but the views are worth it. We did have a few problems but the maintenance department from CabinsUSA was out promptly to fix. Can't wait to return! This cabin was the ultimate in peace and comfort. A little hard to get to. But worth the effort. WAZE or Google maps is a little confusing with their directions to the cabin. The cabin is spacious. We were originally planning to have my daughter and 3 grandchildren with us. They were unable to come at the last minute. All I could think when I got there was how much they would have loved the cabin also. It would easily accommodate with superior privacy my daughter and her 3 boys, as well as my son's family with 1 child. The downstairs is like a separate living area. I insist on everyone having a place where everyone has their own space when traveling. We will seek out this cabin again. I am a picky picky when it comes to rental lodging, but this was wonderful.